Tuesday was a perfect day ... bluebird day, no wind, temps close to zero degree celsius, and plenty of hero snow to be harvested! PilotPeak01142014 from Santiago Rodriguez on Vimeo. We ski toured the Lamar ridge area at Pilot Peak. 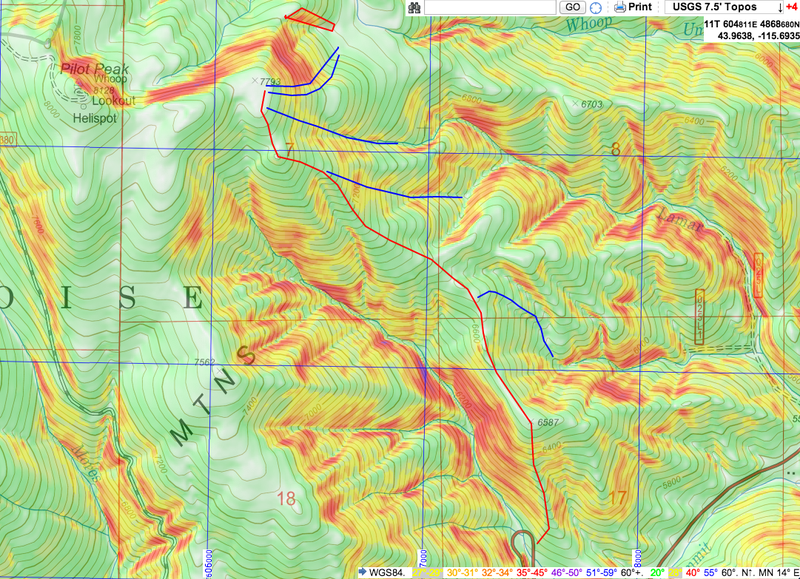 The polygon at the top of the topo map denotes a recent avalanche we will provide comments later in the post. Due to the warm temps and clear skies, any slope at any elevation with any south has developed a devilish crust. I expect that slopes with East component will become crusty next. The other side of the coin, is that the snowpack is experiencing settlement and that might help in promoting the sintering of the problems weak layer now buried. The snowpack below 6500 is 1 meter deep, at 7000 feet is 1.2 meter deep, and at 7800 feet it is 1.5 meter. At 7800 is unconsolidated, thus keep at least one ski on as you transition from ski to tour mode, or you risk sinking deep into the bottom basal facets. 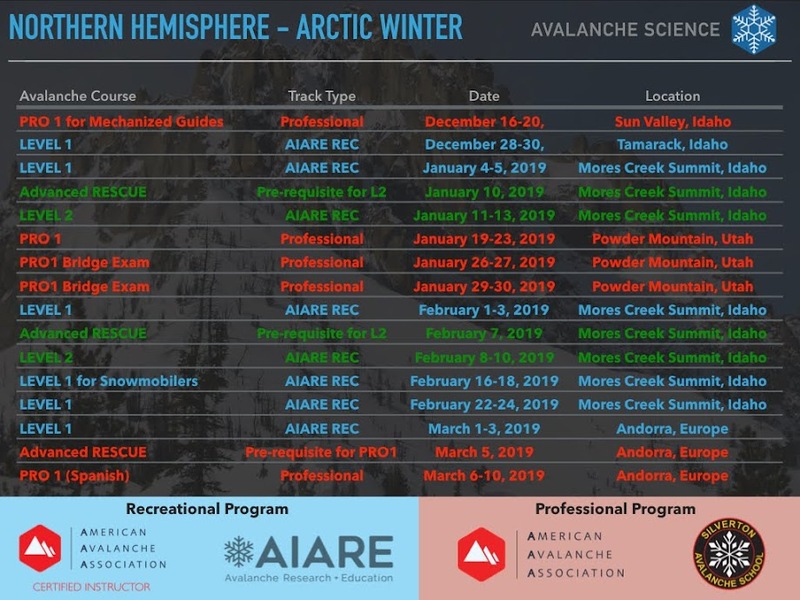 The snowpack produced only whumpfs below 7000 feet, where it appears it is easier to trigger a buried advanced facets in top of a crust at the 55 cm depth. At 7800 feet this layer is found at a depth of 80 cms. Stability testing produced negative results for the 35 cm layer of near surface facets above crust buried by the last storm. But the advanced facets buried between 55-80 cm (depending on elevation) continue to produce energetic propagation with sudden planar failures (Q1). The ECT (Extended Column Test) failed to propagate a fracture at the 80 cm depth, but the layer of concern is deeper than the recommended weak layer maximum depth of 70 cm. ECT with weak layers deeper than 70 cms results in false stables. Testing with PST (Propagation Saw Test) failed after moving the saw 25 cms along the fracture plane. The fracture propagated to the end of the column. Pilot01142014StabilityTest from Santiago Rodriguez on Vimeo. Notice that in the video, I do not let the ECT go wasted after it fails to provide evidence of propagation potential (due to depth of weak layer > 70 cms). In the spirit of searching for evidence of a structure favorable to propagation the snow saw is used to disturb the weak layer, and a fracture is initiated and propagated. Once the failure occurs, gravity takes over and the slab slips (slides) into my face ... pretty funny ... watch the video! While performing stability test in the snowpit, the snowpack failed around us. The failure occurred at the 80 cm weak layer. Check the next picture with the snow saw next to the vertical crack. The vertical clean cut in the snowpack corresponds to the PST column we were isolating during the fracture. We would have liked to ski the much steeper shots of the Whoop-Em-Up headwaters, but we kept the slope angles to less than 35 degrees, and repeatedly used our sight through inclinometers to verify that we were not venturing into steeper terrain. Recall that the snowpack has a serious structural weakness now buried at 80 cm and it is capable of producing destructive avalanches. AND few hundred meters away, the remains of an avalanche at that same layer of concern occurred during the last 48 hours demanded a conservative approach. We did not get close enough to capture a better picture of the avalanche , since we wanted to continue skiing, but we were able to notice that the avalanche ran at the weak layer of concern. The avalanche ran full length through the trees and was of destructive size 2, well capable of killing a person. At most aspects and elevations, there is a delicate layer of surface hoar, and at slopes with southeast aspect the layer rest in top of a crust. This might become problematic if it is not destroyed by warm temps or wind prior to the next storm cycle. Surface Hoar above the crust layer. The views of sawtooth were splendid and Copper Mountain at Banner Summit could be easily identified. As shown in the video at the beginning of this post, the skiing was fun. Next some pictures that showcase the skiing terrain we skied. Next a view from Top of the World, Almost Top of the World, an dthe Summit Creek Glades from Lamar Ridge. As you can see in the picture above, this small avi is located in nasty terrain trap. The idea is that you study these two pictures, and avoid this line during times of of avalanche concern.